For his clients, he is an angel of mercy; for his opponents, a doctor of death. But behind the fierce debates and spectacular trials is an accomplished inventor and artist; a man who never married but devoted his life to the care of others; and a passionate crusader who brought us to the forefront of a moral crossroad. Join David D'Arcy to discover how a curious pathologist turned into an expert on death and challenged our ideas of life and personal self-determination. Jack Kevorkian looks back on a controversial life, with observations from defense lawyer Geoffry Fieger and biographer Neal Nicol. Journalist Jack Lessenberry and NPR's Don Gonyea takes us through the sensation trials of the Michigan court system. Actor Al Pacino, who portrays Kevorkian in the upcoming HBO film, takes us into the psyche of this complicated man. Medical ethicist Dr. John Hardwig, end-of-life specialist Dr. Timothy Quill and disability advocate Marilyn Golden illuminate the complex facets of physician assisted suicide. If you have questions or would like more information, contact Matthew Long-Middleton at Murray Street <mlm@murraystreet.com> or 888-675-2363. - CBS News/60 Minutes—22 November 1998: Mike Wallace interviews Kevorkian and broadcasts Dr. Kevorkian’s video of his lethal injection of Thomas Youk. This act eventually led to Dr. Kevorkian’s conviction for second degree murder. - Investigation by the The Detroit Free Press on Dr. Kevorkian's "assisted-suicides," published 3 March 1997. - Frontline feature on Dr. Kevorkian—including a Kevorkian chronology, a description of Kevorkian’s death machine—the Thanatron—and pictures of Kevorkian’s artwork. - Letter from Kevorkian to Hon. William Hubbs Rehnquist, Chief Justice, Supreme Court of the United States. - WDIV TV Detroit interview Dr. Kevorkian and with Kevorkian’s friend and assistant, Neal Nicol. - WJDK TV Detroit coverage of Dr. Kevorkian after his release from prison on June 1st, 2007: an interview with Dr. Kevorkian and clips from his first news conference. - Over a dozen links to interviews and programs on assisted-dying, including Fresh Air, Weekend Edition, and Talk of the Nation. - Humphry, Derek. Final Exit: The Practicalities of Self-Deliverance and Assisted Suicide for the Dying. - Kevorkian, Jack. Prescription: Medicide: The Goodness of Planned Death. - Dworkin, Gerald. R. G. Frey, ed. Euthanasia and Physician-Assisted Suicide (For and Against). Sissela Bok, 1998. - Rosenfeld, Barry. Assisted Suicide and the Right to Die: The Interface of Social Science, Public Policy, and Medical Ethics. , 2004. - Svenson, Arthur Gordon and Susan M. Behuniak Physician-Assisted Suicide: The Anatomy of a Constitutional Law Issue. - Smith, Wesley J. Forced Exit : The Slippery Slope from Assisted Suicide to Legalized Murder, 1997. - Smith, Wesley J. "A View to a Kill." National Review Online, December 14, 2005. - Quill, Timothy. Physician-Assisted Dying: The Case of Palliative Care and Patient Choice. Johns Hopkins University Press, 2004. - Vonnegut, Kurt. 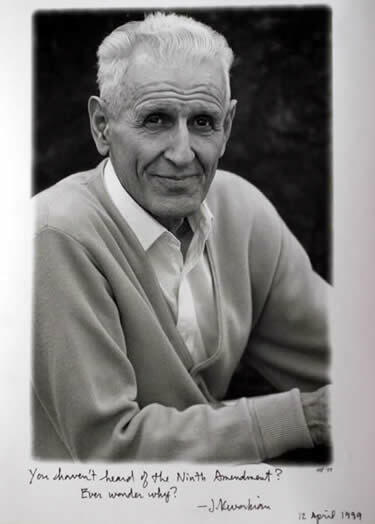 God Bless You Dr. Kevorkian. Washington Square Press, 2001. Special Thanks to Bee Holder Productions and Foundation Films, producers of the documentary Kevorkian. Support for this program comes from HBO--presenting "Dr. Jack Kevorkian . " Our line producer is David Bailes. 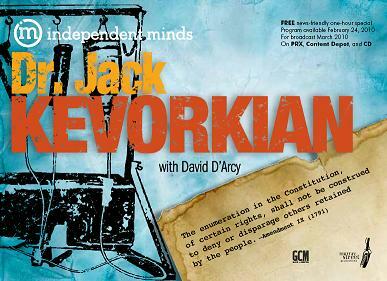 INDEPENDENT MINDS: Dr. Jack Kevorkian is an hour-long special.